September 21 – The build-up to the launch of the FIFA 19 video game from EA Sports is in full swing with Cristiano Ronaldo, Neymar and Kylian Mbappe starring in a new ad for the game tagged ‘Champions Rise’ that goes on sale September 28. 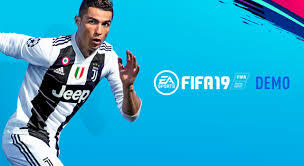 Ronaldo is the star on the cover of the game box and has a central role in the ad where a group of friends are playing as Ronaldo in his new Juventus colours. When a ball breaks through the screen the game turns from virtual to real as Neymar and Mbappe enter and Mbappe challenges one gamer to whether he believes he is ‘more Mbappe’ than himself. Later in the ad Ronaldo appears and looks shocked when one FIFA player suggests he is going to play him at centre back – before quickly changing his mind. The demo version of FIFA 19 has already been available to gamers who have had first look at the new gameplay features, prior to the new game having its full launch on PS3, PS4, Xbox 360, Xbox One, Nintendo Switch and PC (Origin) platforms next week. EA Sports has added the Champions League and Europa League tournaments and the third part of the story mode series The Journey for the 2019 edition. The Champions League addition is a key edition to the FIFA 19 game. As well as having the Champions League tournament in kick-off and Career Mode, there will also be a Champions League mode. A new active touch system has also been added to the game and enables closer control of the ball, allowing more creativity and new options for first touches. There are also new tactical options and players can have better control over scoring with a timed finishing system. 50/50 battles on the pitch have also improved.